New Toy! | Food It Yourself! Nothing compares to the feeling you have as a kid playing with a new toy for the first time. That goes double when it is a toy you hadn’t known you wanted. For me, the grown up version of that feeling is the first time I get to play with new kitchen stuff. For Christmas I got a small food dehydrator from a coworker. I finally had a chance this weekend to play with it, and it turns out it is an appliance I did not know I wanted. Drying food is an ancient method of food preservation. Humans have been setting fresh food out in the hot sun for the purpose of evaporating out the moisture for millennia. As with any food preservation method there are a few ground rules that should be followed. National Center for Home Food Preservation has information on multiple ways to dry food. Keep everything really clean. This includes your prep surfaces, the surfaces you dry on, the surfaces you store in, and most especially your hands. Do not try to dry food that is close to spoiling. Check on your food throughout the drying process. Each batch will require a slightly different time to achieve the moisture level you prefer. Atmospheric humidity, size of the pieces of food, temperature, and the water content of the food are going to vary. Only dry foods you like. Make sure you read the instructions for any appliance you use for drying your food. My dehydrator came with general “how to dry fruit” instructions. They listed approximate dry times for multiple fruits. Since it is citrus season I decided to try tangerine sections. 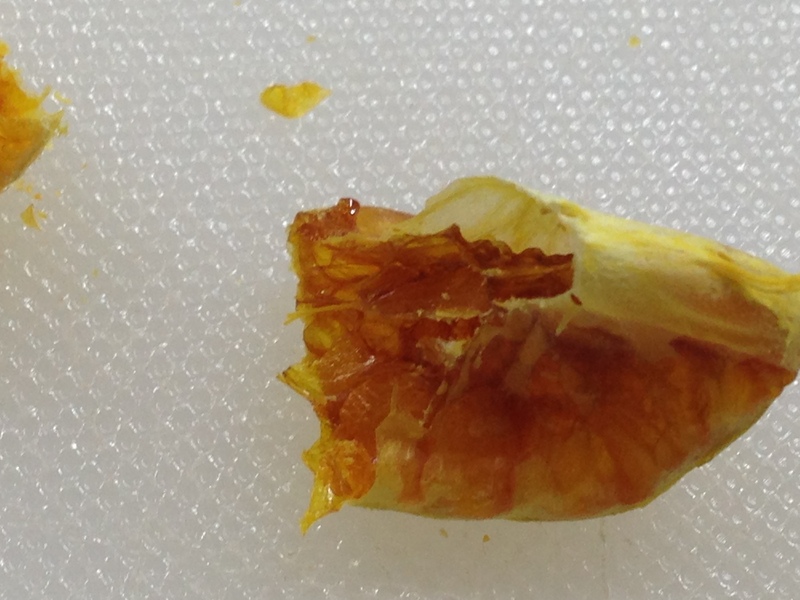 The preparation of Citrus tachibana is really easy- the skins zip right off and the sections can be pulled apart easily. Also, mid-winter is citrus fruit season so I got a three pound bag for just a few dollars. Here is what happened. 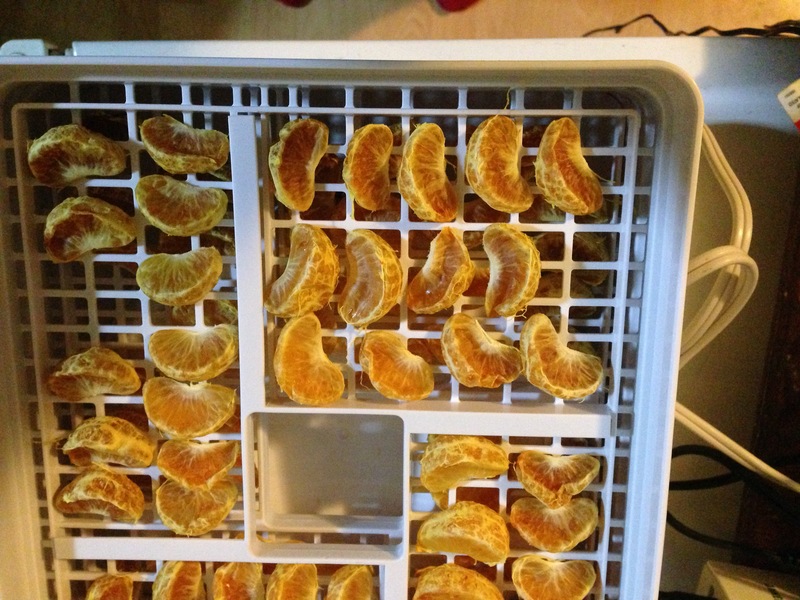 Here are a few impeccably sound tangerines and a few impeccably clean trays from my dehydrator. 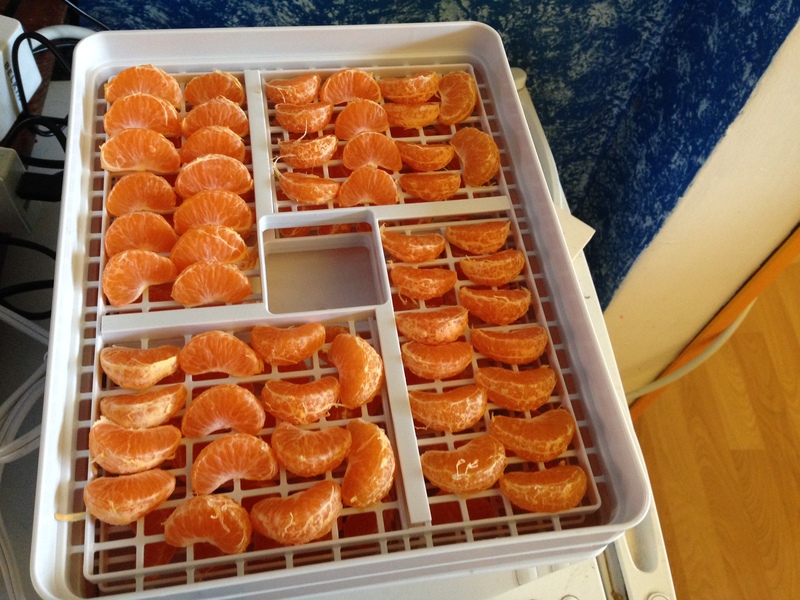 I only filled two trays, since I had no idea if dry tangerines would be something I like. I arranged all the sections in a single layer and set the machine in an out-of-the-way place. I used the corner of my craft table. 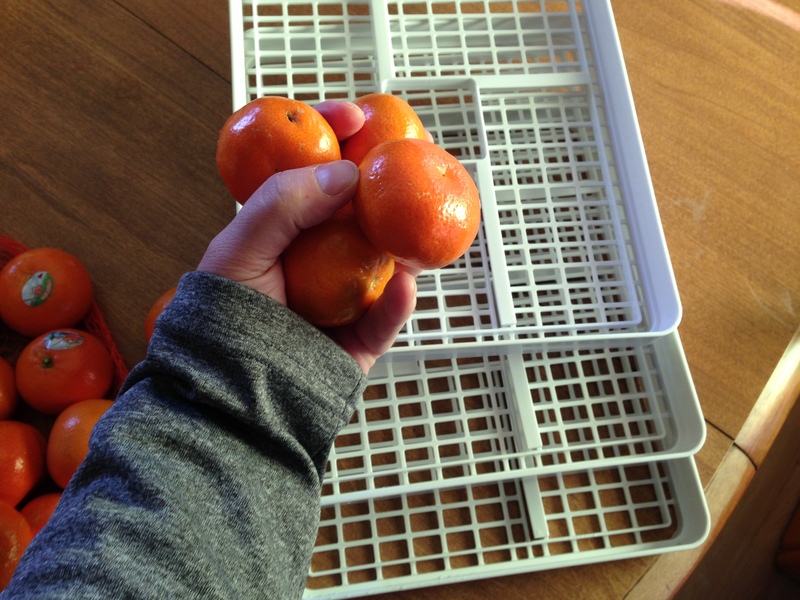 It took about a dozen tangerines to fill the two trays. Here is what I woke up to. The outer membranes were sunken and shriveled and made an unexpected rattling sound when I moved the sections from the trays to a plastic food storage container. Here is a close-up shot of the inside of one section. I know the volume of a fresh fruit is mostly water. I did not realize how hollow the dry sections would be. The final result was a unique snack. The outer membrane of each section had a papery, almost crunchy texture. The inner pulp dried to a leathery texture with an intense flavor. The little strings of pith I did not (but should have) picked off the sections lent a slight bitter aftertaste that actually made the sections taste sophisticated. Because Grown Up People are okay with food being pleasantly bitter. Mr. Food It Yourself and I have talked about getting a food dehydrator, but we were not planning on purchasing one soon. Now that we have one I cannot wait to try dehydrating more foods. What is your favorite kitchen toy to play with? Share in the comments section! Mr. Food It Yourself is eager to try jerky, as well. There are plenty of recipes on line.